The piece, Nurture/Nature, was originally commissioned by the late Mr. Maurice Cohen in 1996. Named Dreampool, David Barr’s creation consisted of a large granite egg that reflected beautifully on its large stainless steel “pool”. Since Cohen, a philanthropist and avid art collector, passed away, his impressive collection has been donated to various people and organizations; Dreampool was given to Mr. David V. Johnson of the development firm Victor International. However, during this transitional period, the piece had been dismantled and the “pool” misplaced. With only part of a sculpture in his possession, Johnson donated the “egg” to the Art Park. With a new home for the “egg,” Barr was inspired to redesign the piece and give it a new life and a new name. 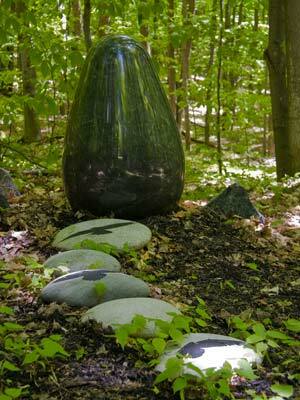 Barr transformed the piece into a set of stone mysteries about life cycles. “To preserve the bird, we must preserve the egg.” Thus, this sculpture’s history is also a metaphor.